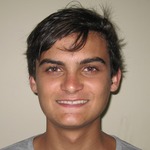 Vinicius is an undergraduate biology student, born and raised in the island city of Florianópolis. After choosing a career in biology instead of studying to be a musician, he went to Australia for university exchange. There, he learned to love sharks and corals alike and that he could unite both of his passions in natural sciences: marine science and microbiology. When he is not in the lab working on the computer or out in the field diving, he likes to bother his neighbours by playing really loud. Thank you for your support David. It means a lot as your work has been of great help for us.